Is bestPT ready for the new ICD-10 codes? Yes! We have successfully participated in several rounds of ICD-10 testing with various payers. The testing was end to end: Meaning the claims were generated in Vericle, sent to the payers and the processed claims were analyzed by our specialists. We are continuing to review and enhance our interface in an effort to minimize the difficulty of the transition from ICD-9 to ICD-10. The deadline to implement it in your practice is October 1, 2015. Can I utilize DSM-V codes in my physical therapy documentation? Yes! bestPT Physical Therapy Billing Software is powered by Vericle and it has custom built documentation which includes a partial DSM-V Code picker. We are continuing to update it monthly to ensure that the documentation needs of our clients are constantly being met. Is bestPT ONC Stage 2 Certified for Meaningful Use? Yes! bestPT is powered by Vericle 4.0 and it has received the ONC HIT 2014 Edition Complete EHR certification, which designates that the software is capable of supporting eligible providers with Stage 1 and Stage 2 Meaningful Use measures required to qualify for funding under ARRA. The Stage 2 certification requires not only that the system have enhanced clinical practice management capabilities, but also improved interoperability with other systems and users. For example, providers can now communicate with patients and other providers using a secure messaging system. Vericle can also electronically accept lab reports and automatically integrate these reports into the patient’s record. How can I qualify for the stimulus? You can no longer qualify for the stimulus – the deadline was 2014. Training for entering PHI can be provided by our Training Department. Are other systems integrated, e.g., credit card processing, patient marketing, appointment reminders, collection agencies? Can I automate patient payments? Patient statements can be automated on a practice level or controlled on a patient by patient basis in our system. Can I send email statements to patients? Some of our integration vendors offer email statements. Can I remind patients of their appointment? bestPT powered by Vericle is integrated with several companies that offer patient reminder calls and text messages. What can I do with patient balances that are not being paid? In the event a collection agency is needed for patient balance, we work with several companies that specialize in collections. Be sure to ask your consultant about our integrated services as the list continues to grow to better serve our clients. They will help you implement anything in our App Store. Do you have workflow management for physical therapy patient care? Yes, we have an exclusive task management system built into our bestPT Physical Therapy Billing Software that’s second to none. Your staff will know what to do for each patient, which in turn gives your patients a consistent patient experience at your practice. How do you ensure all patient generated tasks are completed daily? For practice administrators, a task manager console allows a view into the tasks assigned to each team member. All activity is recorded to allow administrators to track the progress. Tasks allow team members to work together while still maintaining individual accountability. How do you manage who is responsible for which tasks? Each team member has their own task workbench so they know what they need to do each day. Micro-management is not necessary. bestPT powered by Vericle identifies the daily tasks that need to be completed and assigns them to the correct office role, e.g., Front Office or Office Manager. Tasks can be handed off to other team members if more than one person is required for completion. I have a great billing team. Can I use your software without your billing service? Yes, physical therapy clinics that do their own billing can use our system. You can also switch to outsourced at anytime or even use our team as temporary staff when your office staff are on vacation or leave your clinic. This way, your collections and practice do not suffer. 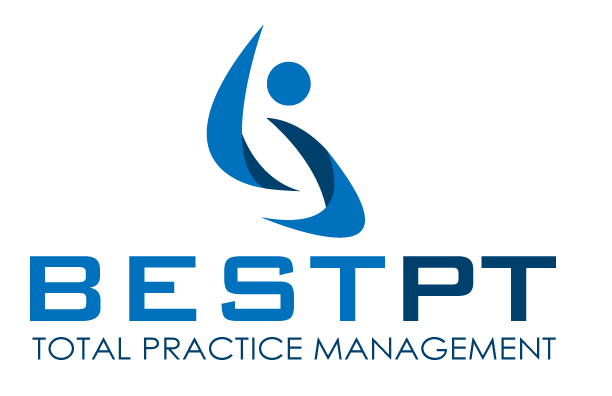 bestPT offers a fully integrated physical therapy Practice Management System and Outsourced Billing Service for Physical Therapists. It includes integrated webâ€“based scheduling, documentation and billing software with a full outsourced billing service that is managed by an experienced team of billing professionals to manage your entire revenue cycle. What makes you different from the thousands of other billing companies and practice management systems on the market? Most physical therapy practices and billing companies have no way to figure out the payers underpayment or delay tactics. Their claim volumes are simply too low and they lack the resources and technology to infer the abuse patterns. Some billing companies also lower their processing costs by cutting down on the number of follow up calls to payers, by skipping the necessary quality assurance procedures, and by saving on technology that allows their clients to observe and measure the quality of the billing work in real-time. Yet some other companies offer only a limited scope of services, leaving the physical therapy practice owner with the headache to figure out patient documentation or practice management solutions. Payers count on provider’s inability to see the big underpayment picture, on lethargic follow up, and on the inefficiencies of their practice management processes. Worse, an inefficient practice is not only routinely underpaid but it is also an easy target for post-payment audits and penalties. integrated solution that includes state-of-the-art practice management and documentation system. To level the playing field with the payers, we use stateâ€“ofâ€“theâ€“art Internet technology, which allows us to discover every underpayment and delay, and to follow up on each case of payer’s non-compliance, regardless of underpayment size. Besides offering a state-of-the-art web-based practice management system that’s available 24/7, we provide our clients & members of our billing network an unparalleled level of transparency and control, including real-time dashboards and thousands of real-time reports. Our integrated approach ensures that you receive alerts on patient accounts at time of service, document each patient encounter, and always bill for your service. Our disciplined process ensures that nothing falls through the cracks. We are not interested in just selling you physical therapy software or billing service. Our product is Revenue Enhancement for Physical Therapy offices. We are looking to establish a long-term working relationship based on trust that delivers results. We have a proven review process for each potential client’s situation to see if the client will benefit from joining our billing network and, equally importantly, if the network of the existing clients will benefit from the new member. This way we ensure that our solution continues to improve with each new client. Do you have a revenue or provider minimum requirement before I can use your service? No. Whether you are a single provider that works on a part-time basis, a new practice just starting out, a medium sized clinic, hospital, or a national clinic with many locations, we will welcome you into our network. Our service does not discriminate on size. What do you charge for physical therapy billing services? It depends on what type of practice you have and how you decide to use our services. With each new client that joins our network, we discuss their goals and business needs and price our services accordingly. The type of services we render can vary differently between a multi-site clinic with 20 Therapists verses a start up clinic with one Therapist doing home care only. Contact us to schedule a discussion with a bestPT Representative. Is there a startup cost? Yes. There is a fee for enrollment with insurance companies and training. We assist you in every facet of enrollment and provide personalized training depending on how you use our service. Some practice management systems and billing companies require an agreement with a minimum amount of time, usually 1 year. Do you have a minimum contract period? No. You can cancel your service agreement with 60 days written notice. 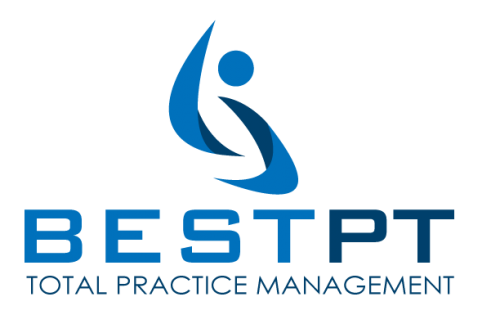 bestPT was created to provide a service that helps Physical Therapists get the most out of their business. We’re only interested in long-term relationships with our clients and it’s in our best interest to ensure you get the highest level of service possible while giving you the peace of mind knowing that you’re not locked in. Do you provide coding services that will allow me to maximize reimbursement? No. As a physical therapy billing and practice management company, we view this as a conflict of interest. Our clients have the responsibility to correctly code their claims. How does your service improve our compliance and help reduce audit risk? Since our service is fully integrated, all facets of the patient encounter are fully documented in a very detailed fashion. The documentation/daily note for a physical therapy patient encounter is completely aligned with the claim submission and reimbursement process to eliminate mismatches in what is documented and what is billed. Everything is electronically stored and accessible at anytime in the event that a payer or legal entity makes an inquiry for information. We store all scheduled appointments, daily notes and claims in our database forever. Our system and process have been used several times to help successfully defend providers in a review or audit situation. Other companies claim they are web based but still require you to install software and perform upgrades periodically. Is that how your system works? No, it is 100% web based. We require the use of the Google Chrome or Firefox Browser from version 2.0 upward. It is free for download from Firefox.com or Google.com/chrome and is available for Windows, MAC and Linux. I use Quickbooks for my accounting, can I import data for bookkeeping and accounting purposes? All reports can be exported to a format that can be imported into many different types of systems, including Quickbooks. We have multiple locations as part of our clinic, can our providers work in multiple locations and still use the systems? Yes. Since our system is web–based, up in “The Cloud,” it can be accessed from anywhere that has an Internet connection and a web browser. Many of our physical therapy clients have multiple locations and they appreciate the easy access from where ever they’re at, even at home or on their phone. I am a director of a multi-site clinic. How can I access data from each clinic? Our service is centralized and provides a consolidated view into any number of clinics and providers. You can view schedules, financial status, and run reports across all your clinics and providers. How long do you store patient records and if I want access to old records, how do I get them? We store all patient records forever and they can be retrieved at any time. If you use a modern web browser like Google Chrome or Firefox, then you can access our cloud-based physical therapy software from where ever you are if you have an internet connection. Yes. We follow all of the HIPAA guidelines. Our data transmission method is via Secure Sockets Layer (SSL). This means that all of our data is encrypted when your office communicates with our system. I’ve already invested in a scheduling and documentation system. Can I use your billing along with my system? In most cases, yes. We have many clients that use other systems for scheduling and documentation and bestPT for managing their billing. We’ll need to review what you have to ensure we can support you properly. I really like your billing service, but I’m not a PT. Can I still become a client? Yes! bestPT specializes in Physical Therapy and Rehab but works with several partners that support other specialties that are part of the bestPT Network. Virtually any medical profession that bills insurance companies can use our cloud-based software. I already use a billing company and want to switch to you. Will there be a period when I will not receive revenue? Your cash flow may be delayed during the enrollment process, depending on your payer mix. It really depends on the size of your practice, the number of providers involved and the mix of payers. We have multiple channels for support. There is an online request ticket workflow as part of our system, online support forums, documentation, and training videos. When you first become a client, you are assigned a Coach to you to help you when you join our service network. I want to do my part to improve the environment, is your system paperless? Our system is 99% paperless. In some cases, we may need to print information to send to payers during the enrollment and denials management process.